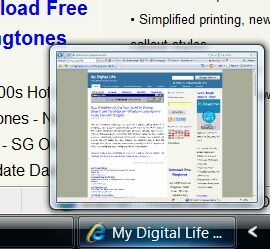 One good thing about Windows Vista Aero interface (DWM.exe) is that whenever users hovers the mouse point over the taskbar button for the window, minimized, in the background and even window that currently active and in focus, a live preview thumbnail of the application or program window will appear on top of taskbar. The live window taskbar hover preview can even support playing or streaming video or movie in animated preview. However, the thumbnail preview is kind of small, hardly allow users to see anything meaning, not to mention able to view movie in ‘thumbnail mirror’ while doing other tasks simultaneously. 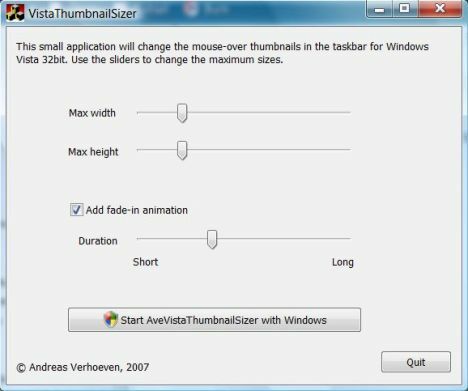 Vista Thumbnail Sizer is a utility that allows user to change (increase or decrease, if you feel that it’s too big) the size of the taskbar preview thumbnail pop-up that is shown when user hovers mouse pointer over the taskbar button for the window. The utility also features ability of fade-in animation. The bigger size application program window preview when hovers above button on taskbar. The size can go larger and bigger, or you can make it looks very small too. Beside, Thumbnail Resizer only enlarge or reduce the maximum thumbnail size of the Aero hover over preview without affecting its functionality, i.e. it Thumbnail Sizer uses the compositing engine built into Windows Vista, so the live video preview on the application window of media player or Flash animation viewer will still appear on the thumbnail as usual default preview. 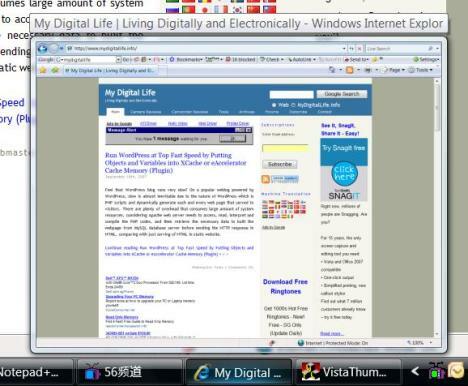 The default maximum thumbnail size in Windows Vista is hardcoded in Explorer.exe. VistaThumbnailSizer finds the position of the value in Explorer.exe’s memory and then change the size value to user defined value. The application also loads taskbandhook.dll hook library into Explorer.exe which tries to detect if there is any reset on taskbar and reapply the change. The hook also needed to support the option to fade the thumbnails in with a nice animation, rather than just appearing instantly. As you can see, the program will change and muddle with internal data structures of Explorer process, any bug will cause Windows Vista system to hang, go down or unload itself. So use VistaThumbnailSizer with care at your own risk. Both Windows Vista 32-bit (x86) and Windows Vista 64-bit (x64) is supported. Must be run with the same privileges as Explorer.exe. Normally simply double click the executable from desktop will do. Windows Aero (DWM) must be supported and activated. Download Vista Thumbnail Sizer from Ave’s Vista Apps. Source code is also available for programmers who interested. Once downloaded, simply unzip and run the AveThumbnailSizer.exe app. In the program window, there are 2 sliders where users can use to adjust the “max height” and “max width” size of the previews when mouse over. The change will take effect immediately, and you can instant mouse over any window button on taskbar to see the new size. Bottom part is the fade-in animation setting with long or short duration slider. Once set the maximum size to the value you desired, close the window to make the application run in the background. To completely exit the Resizer application, click on Quit button. To make the new preview thumbnail size permanent and apply even after computer restart, the AveThumbnailSizer.exe must be loaded on every startup. To do this, simply click on Start AveVistaThumbnailSizer with Windows option button at the bottom on the application window, which will launch autostarter.exe program to set parameter so that Sizer utility will be auto starting on logon. You can also do this process manually, by placing a shortcut to AveThumbnailSizer.exe -hide (note the -hide switch so that you won’t get disrupted with any dialog) in the Startup folder (full path is %APPDATA%\Microsoft\Windows\Start Menu\Programs\Startup, where you can copy and paste to address bar of Windows Explorer to access, else explore the Startup folder from Start menu). -kill - kills the application. -show - brings up the dialog. -nohook - does not start the apps hook. -hide - does not display the dialog on start.